drugstore finds | preciousandmakeup.org || it's just a beauty thing. I decided to do two tutorials featuring the Rimmel eyeshadow palette from this post. This smokey neutral look is spiced up just a tad bit, enjoy! 1) After applying an eyeshadow base to the eyelid, passed the crease, and up to the browbone, apply a light bronze eyeshadow on the lid and passed the inner crease. 2) Use a deep reddish bronze eyeshadow and apply it to the outer crease up to the browbone. I also applied Artistry Eyeshadow in Espresso to darken up the deep reddish bronze eyeshadow. 3) Because I love black eyeshadow for depth + an even smokey look, I apply Artistry eyeshadow in Black Tie on just the outer crease. For a highlight color, I used a light beige eyeshadow on the browbone. 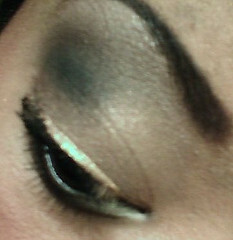 4) For a pop of color, I use Milani liquid eyeliner in Gold on the upper lashline. 5) Apply a brown eyeliner on the lower lashline 1/3 of the way. Set the liner with the deep reddish bronze eyeshadow on top. For the inner side, apply the an eyeshadow base and then, a light beige eyeshadow on top. Lastly, apply a few coats of black mascara on both the lower and upper lashes. Voila, a kicked up BUT simple smokey neutral look! I use to wear NYC’s false eyelashes back in my early years in high school. (Like,I still am now) I was obessed with eyelashes. I re-introduced myself to NYC lashes a few days ago and I have no clue as to why I stopped wearing them. Although, they are self adhesive, I used Duo eyelash adhesive (best glue for any false eyelashes). They are so easy to put on and are perfect for first time false eyelash users who don’t want to spend too much on lashes quite yet. These lashes are less than $2 at my Target. I’d stock up considering it’s the halloween season and I’ve noticed that NYC lashes usually sell out more so during this time of year. They give Ardell a good run for their money. Not everyone wants to spend $15+ on an eyeshadow or $20 on eyeliner. Sometimes, I find that some drugstore cosmetics are better than the cosmetics I’ve tried that are high end. Here are just some of my favorite drugstore alternatives that are high in quality but, not high in price. Milani Cosmetics Eyeshadows; I LOVE Milani Cosmetics! Their eyeshadows are amazing. They have some of the prettiest netural colors & a purple color that is gorgeous. The quality/color pay off of Milani eyeshadows are great & work well on women of color. Glides on well & nice in texture. I even sometimes use Milani eyeshadows on my clients. If they are good enough for a make up artist to use,they are definitely worth using it on your eyes. They only cost $2.99 at my CVS. Rimmel Extra Super Lash Mascara; This mascara is pretty good for a drugstore brand. Although, I don’t use it anymore (I use my FAVORITE Artistry mascara;non drugstore),I use to use it a lot & liked how it didn’t clump up my lashes. I found that it worked better when the mascara is “aged”. It only cost me $2 at Target. Rimmel Exaggerated Full Colour Eye Definer; I still use this eyeliner & it’s the best drugstore eyeliner out there. It glides on smoothly, the color is vibrant/bold & the lasting power is great. I prefer retracable liners over regular pencils so, this great for someone who doesn’t like regular pencils. This little liner will only set you back $4. Wet n Wild MegaLiners; I plan on doing a full review on these liners & I have to say..I’m a HUGE fan of them! They are long lasting & they don’t “crack”.My favorite colors are the green, purple, & the brown. One of my staples when it comes to liquid liners. They only cost $2.99,what a steal! NYC Color Browser Brow Kit; I stumbled upon this gem about two years ago at my local Target. I’ve been hooked ever since. This is stuff is amazing. It comes with everything you need to do your eyebrows. It comes with a powder color,a grooming wax, tweezers, & an angled brush to apply the color & groom wax with. My eyebrows stay put & they look natural. This stuff last a long time as well. Very low in price & will only set you back $3.99. L’oreal HIP Blendable Creme Blush; For a drugstore brand,this creme blush has A LOT of pigment. A little definitely goes a long way. I love how this creme blush gives a powder finish & best of all..it’s blendable. It’s not sticky like regular creme blushes.Well worth the $10 & this product last a long time as well. You are currently browsing the archives for the drugstore finds category.